A tech site claiming to have gotten its hands on Hewlett-Packard's unreleased Slate tablet PC deems it an unimpressive iPad competitor. The site, Mexico City-based Conecti.ca, doesn't mention how it got a hold of the HP Slate, but conducted a mini-review of sorts complete with photos. 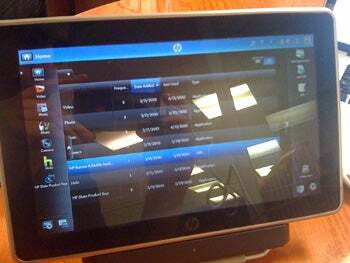 HP's Slate has been mostly a mystery, with no official specs, no availability date, and no further details from HP. If Conecti.ca's report can be believed, the upcoming HP Slate tablet appears to be more of a netbook and less of an iPad, posing little threat to the strong iPad sales. Without staged shots and carefully arranged teaser videos, the alleged Windows 7-powered HP Slate doesn't seem as glamorous in the hands-on shots from Coonecti.ca. The report, written in Spanish and translated with Google Translate, highlights some shortcomings of the Slate, such as "long and annoying" loading time for the OS. As seen in Coonecti.ca's photos, the screen and the back of the HP Slate are made of plastic, and the reviewers note that it is still feels dense and tough. The alleged Slate is also slightly thicker than the iPad (0.57-inch versus 0.5-inch). These latest impressions of the HP Slate arrive only days after allegedly leaked specifications of the Slate, which revealed that the tablet would also feature half the battery life of the iPad (5 hours versus 10+ hours for the iPad). The Slate features two external ports, USB and a dock connector. The HP Slate dock expands connectivity with two more USB ports, HDMI output, audio jack, and a power outlet (judging from the Conecti.ca photos). The tablet also features a smaller multi-touch screen than the iPad (8.9-inch versus 9.7-inch). So far, Connecti.ca official verdict on the HP Slate is "Meh" ("the verbal equivalent of a shrug of the shoulders"). Its comparison of the Slate with a glorified touchscreen netbook without a keyboard seems fitting, and I find it hard to believe most people would choose a $549 Slate over a $499 iPad. HP still has a long way to go, considering it hasn't even announced availability for the Slate yet.